The first species that usually come to mind when thinking of cichlids are angelfish, discus fish and Oscars. Although these are beautiful fish, they aren’t suitable for just any type of aquarium: two of these species are actually on the list of the worst beginner fish, and for good reason! 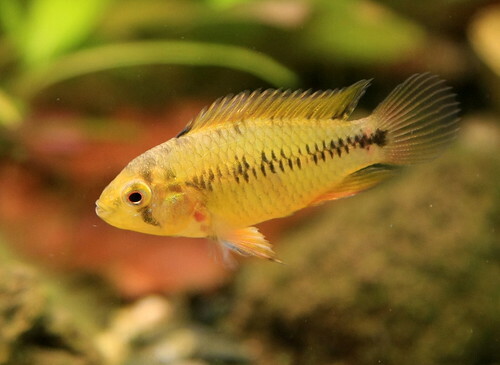 If you want to keep cichlids, whether in a community tank or on their own, the more peaceful dwarf cichlids on this list (including the popular Apistogramma) may be a better starting option. Starting off with my personal favorite, Neolamprologus multifasciatus is a shell-dwelling Tanganyika cichlid . Though not as colorful as the other dwarf cichlids discussed here, they make up for that in many ways. For example, they can be kept in harems instead of pairs even in smaller setups, as they’re very tiny and only require a minimum of around 15 gallons (57L). They will also tolerate most peaceful tankmates. Their most interesting trait, though, is the fact that they form small territories around snail shells! This makes them very fascinating to keep and definitely different from other small cichlid species. To imitate the natural habitat of your Neolamprologus multifasciatus, use a sandy substrate and be sure to provide plenty of snail shells (you can use food safe ones that are meant to be used to present edible snails in, like these). Two shells per fish is a good place to start; be sure to spread them around the tank. As with all cichlids from these regions, harder water with a higher pH (neutral or higher) is preferable. Nannacara anomala, better known to some aquarists as golden dwarf cichlid, are a dwarf cichlid species with beautiful gold and blue coloring. Their small size, hardiness and peaceful nature make them a great choice for beginners who are looking for their first (dwarf) cichlid. You can keep Nannacara anomala as a couple in at least a 20 gallon long aquarium (75L), although if you’ve got a larger tank it’s also possible to keep a harem: one male and multiple females. Keep in mind that like most of their cousins Nannacara anomala can become relatively aggressive when guarding eggs, although this shouldn’t be a problem if your setup is large enough. Like many other (dwarf) cichlids, Nannacara anomala prefers a relatively densely planted tank and will definitely appreciate some driftwood or clay pots as a place to hide and spawn. Although they are very hardy and will tolerate a wide range of water values, they prefer softer water. Although some aquarists report difficulty with getting their Nannacara anomala to take dry foods you should try to offer a varied diet. They can be fed anything from cichlid pellets to zucchini to live foods. Apistogramma cacatuoides, also known as cockatoo cichlid, is a dwarf cichlid named after the male’s bright coloration and large fins, which can range from yellow to red. Although these fish aren’t the absolute most peaceful dwarf cichlids around, especially when dealing with eggs or fry, they will cohabit well with peaceful bottom dwellers and schooling fish like rasboras. They are suitable for beginners due to their hardiness and ability to adapt to a wide range of water values. 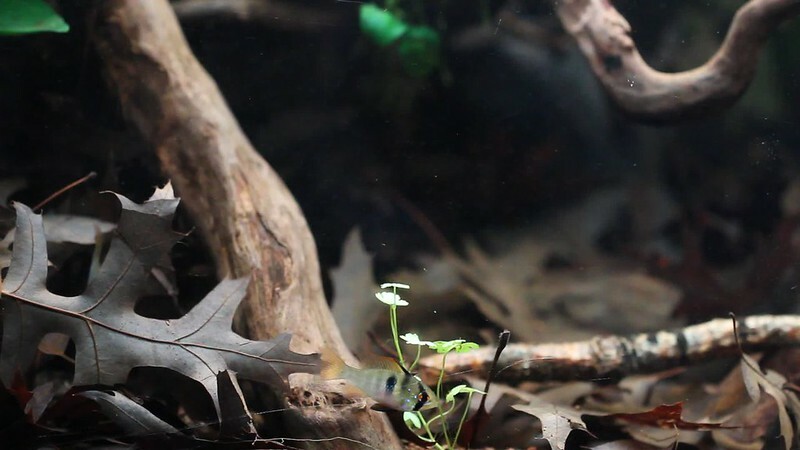 A male/female pair of Apistogramma cacatuoides can be kept in at least a 20 gallon long (75L) aquarium. You can also keep a harem in larger aquariums. A planted tank is preferred, and if you’re interested in breeding these cichlids it’s also a good idea to provide some type of cover in the form of flower pots or cichlid hides, which will be used to lay eggs in. When it comes to tankmates, as with most cichlids it’s best to avoid other (dwarf) cichlids, especially in smaller setups. Small schooling fish are a much better idea and should usually be left alone. A favorite for many aquarists when it comes to dwarf cichlids is Mikrogeophagus ramirezi or the German blue ram. This feisty number is appreciated for its spectacular coloration and interesting behavior. A large aquarium is not needed if you’re interested in keeping a pair of German blue rams. A 15 gallon (57L) long tank should do. The challenge is in maintenance, not set-up. German blue rams can be very sensitive due to bad breeding practices. Water quality should always be pristine and you should avoid overly assertive tankmates. Small, peaceful tetra species like neon tetras work better. Seeing a fish labeled as a German blue ram even though the colors are all off? It might very well still be the species you’re looking for. Mikrogeophagus ramirezi has been selectively bred into many different color varieties. These include “electric blue” without the typical markings as well as a golden/yellow variety. One fish that does look a lot like the German blue ram and might be confused with it is the closely related Bolivian ram (Mikrogeophagus altispinosus). Though less popular, the larger Bolivian ram actually makes a better choice for most beginning aquarists. It isn’t as fragile and does well in many communities. Pelvicachromis pulcher, also known as Kribensis cichlid, is one of the most popular small cichlid species available in the aquarium trade, and for good reason! Their striking red belly and interesting breeding behavior make them a great addition to most types of community aquariums. As always you should keep in mind that these cichlids may lash out at tankmates during breeding time and plenty of space is needed to maintain peace in the aquarium. At least a 20 gal long (75L) aquarium is recommended for a single pair, although more is better. Peaceful tankmates like Corydoras and tetra species are ideal if you want to prevent any trouble. Breeding Pelvicachromis pulcher is considered very easy and possible for beginners. In a tank with soft, acidic water, plenty of hiding places and a fine sand substrate, breeding will often occur even without any interference (provided you have a proven pair). Plants are also appreciated as they provide some extra cover. Though a bit less colorful than their close cousin Apistogramma cacatuoides, Apistogramma borellii is fun to keep and suitable for beginners due to its relatively peaceful nature and hardiness. It also doesn’t require a very large aquarium: a minimum of a 15 gallon long (57L) is recommended for a single pair. When it comes to aquarium decoration, water values and tankmates Apistogramma borellii adapts easily. A planted setup with plenty of hiding places and caves is preferred. A wide range of pH values and temperatures is tolerated, as these fish naturally come from waters that can vary quite drastically when it comes to water conditions. This doesn’t mean you can skip the water changes, though: they are still very sensitive to ammonia, nitrite and nitrate and should only be introduced in a fully cycled tank. You can keep your Apistogramma borelli in a community aquarium, although it’s advised not to combine them with bigger, aggressive fish. If you’re looking for more relatively easy aquarium fish besides just cichlids or as an addition to your dwarf cichlid tank, be sure to have a look at the lists of peaceful community fish and best beginner fish. Be sure to do extra research before buying and combining aquarium fish to prevent any problems! If you have any more questions about these peaceful cichlids or want to share your experiences, don’t hesitate to leave a comment below. Happy fishkeeping! the pond is about 300 litres, and is slightly leaky, (a quarter of its volume a day) and is on a flow-through system. it’s got a muddy bottom for a lotus plant growing in it, and is about 30 cm deep and a meter square. any suggestions for a brightly coloured fish? What kind of climate do you live in (if it’s an outdoor pond)? That’s a pretty important factor! Very interesting read. I have been wanting to start a cichlid tank myself, but have only ever had experience with tropical schooling fish. This was a great start for me in realizing it would be possible with what experience I have. That was the goal of this article! Cichlids are often considered too difficult or intimidating even though there are plenty of species that are relatively easy and very interesting to keep. Well, that enlightened me about cichlids, I’d always been wary of them due to specific requirements, size, water,etc. Think I’ll think harder about these in the future if a tank opens up. I had the same thing when writing this! I knew about their care but they never really appealed to me for some reason – until now. I just love the little shell dwellers especially.